Make an Elvis song into a BOOK contest! **After I listened to an old Elvis Presley hit called “She’s Not You”, I couldn’t get the words out of my head. Finally, it came to me. The sentiments were so beautiful that the story they told should be written. So, I wrote the first chapter and the song stopped haunting me. I released book #1 of the Elvis Series late in Nov. When it came time to decide which of Elvis’s song should be chosen for Book #2, I decided who better than the readers themselves to make the choice. Here it is live for the whole month of February. I find myself wondering if any copyright implications are involved in something like this? I only ask because I've always wanted to write a story inspired by Bob Dylan's song "The Ballad of Hollis Brown" but it seems some sort of intellectual property right would apply and need to be looked into. Thanks so much for having me as your guest, Cheryl. I hope your followers enter the contest and I wish them all the best of luck! My pleasure. Good luck to everyone! I don't exactly have emotional attachments to Elvis songs because it was before my time, but it should be an interesting contest! My wife grew up watching his old movies with her parents, but this wasn't one that had any influence in my life growing up. Granted he is a bit before my time (think he died the year I was born). I did go to graceland once years ago. My mom was an Elvis fanatic but she listened to his later stuff – you know, his blimped out Vegas years. That and the Christmas album, which is hilarious listening to it now. Although I grew up at a time he was at his high point, I was more of a Beatles fan. They just seemed to “sing” to my young heart. 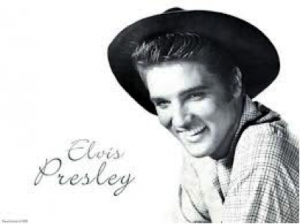 What I can say about Elvis is, as an adult, I now appreciate and understand his talent and artistic gifts. All that said, I wish you the very best with your book. What a cool idea for a book. I love the music of Elvis so much. I think "I Can't Help Falling in Love with You" is probably my favourite. We had it as the song at our wedding back in 1975 and the love for the song has stayed with me even though the marriage didn't last! How about "Love Me Tender"?